Valor Exteriors donates a portion of our profits each quarter to support Operation Second Chance (OSC) and helping heroes move on. OSC supports Veterans and their families by building relationships and identifying and supporting immediate needs and interests. They are dedicated to promoting public awareness of the many sacrifices made by our Armed Forces. In addition, the team at Valor Exteriors volunteers our time and resources in conjunction with OSC to assist Veterans in finding employment within our company and affiliate companies. Charles Frederick Heinbuch, Jr. and Deborah Susan Hendry-Heinbuch were married on December 15, 1969. They are parents to me, and to my brother, Jeffrey Candler Heinbuch (d. January 7, 2015). My Dad was career military, having entered the U.S. Navy at age 17. When his service ended on November 17, 1975 – five days after my fifth birthday, he had been stationed aboard the U.S.S. America (CV-66), performing as an Investigator and Master-at-Arms. The America was on constant deployment during the Vietnam Era, so I didn’t get to see my Dad very much. But military families often look forward to “Return to Homeport” events more than birthdays and Christmas, so we had that! I remember the air smelling like popcorn, and Ronald McDonald was always there. I had to walk-run to keep up with my Mom, who had my brother (wearing a cloth diaper) on her hip as she headed toward the pier. Even as a small child, I knew that watching the crew “manning the rail” would be one of the most beautiful sights I would ever see. My Mom and Dad were the quintessential military couple. Dad put himself in danger for hazard pay so that he could better provide, and Mom took care of us while she patiently waited for his homecoming – keeping busy so as not to dwell on any danger he may have been in. When he was on leave, he brought tens of sailors home with him. Everyone was family. In 1976, my Mom settled on a home that she purchased utilizing my Dad’s death benefits. He was only 30 when he passed and she never remarried. This house is my Mom’s “sanctuary”. If she has been away, you will hear five words pass through her lips as she crosses the threshold: “Be it ever so humble … ”. She thanks my Dad for this house daily. I have few but vivid memories of my Dad, and I grew up hearing stories about him – things that make me proud. He earned a Bronze Star Medal with Combat “V” for “meritorious service … as a River Boat Patrol Captain” in Vietnam from June 1968 to June 1969. He has a Vietnam Campaign Medal and a Vietnam Service Medal. He has several Purple Heart Medals, Navy Achievement Medals, and National Defense Service Medals – many of these earned before I was born. Every time I pour over his military achievements, I learn more about what he put himself through for what was right. We were broke growing up, but Mom chose to stay home until my brother was in High School. She volunteered for our elementary school; she took classes of her own and became a published writer, and then she became the City Clerk of Annapolis. My Mom’s generosity knows no bounds. She has borrowed against her home to help others in very big ways, and often; her current mortgage is at market value. She has a systemic blood cancer, but she’ll split her lilies in the morning before chemo to share with the phlebotomist. That’s my Mom. A few weeks ago, my fiancé and I went to a trade show in Baltimore. I found myself in front of the booth for Valor Exteriors. I was engaged in conversation with Brian Bauer, the President of Marketing for RenVison and Valor – and the end result is nothing short of miraculous!! Valor’s “Help Raise a Roof for a Vet” program is going to install a new roof on my Mom’s house because of my Dad’s service!! She is being offered the most amazing kindness from Valor, and it is also as if my Dad is still providing for her. If that isn’t enough? 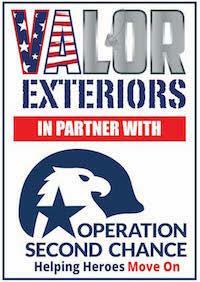 My fiancé, a war veteran from the US Marine Corps, is now proudly employed with Valor Exteriors. They both deserve the world, and it amazes me how the world came about! !